The PP market has been on a bearish trend since the middle of May in China, according to ChemOrbis. Players in the country voice their expectations for a new round of price cuts for August due to a number of reasons including ample supplies, lower spot propylene costs in Asia during July and moderate demand. Import homo PP prices in China retreated by $15-20/ton from last week. A trader reported, “Demand remains limited even after the most recent round of price cuts and most players antickşmipate further reductions given ample supply and softer energy costs,” the trader stated. 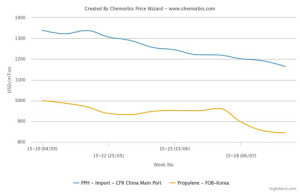 According to ChemOrbis Price Wizard, import PP prices have hit the lowest levels since March following the latest drops. China is foreseen to become self-sufficient by the year 2017 thanks to recently added coal-based PP capacities. Since last year, the country saw approximately 4 million tons/year capacity while nearly another 3 million tons/year is on its way. In addition, the local market plunged around $200/ton since early May, according to ChemOrbis Price Wizard. “Local prices are down around CNY50-200/ton ($8-33/ton) since the start of the week and import sellers are struggling to remain competitive with domestic material,” a distributor commented this week. 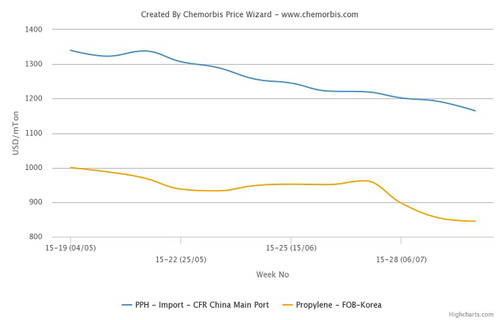 According to ChemOrbis, PP prices may see further losses in the days ahead as China’s ongoing economic slowdown combined with weaker energy costs and the country’s massive recent additions of coal based capacities are keeping the market under downward pressure. Plus, spot propylene costs indicate a cumulative drop of around $100/ton on FOB South Korea basis since the beginning of July with weaker crude oil futures standing below $50/barrel on the NYMEX as of late this week.